Brush up on your data science and SQL skills with Vertabelo Academy’s interactive courses. You get instant access to lessons that teach various concepts of SQL, data science, and programming in R (soon also in Python!). Our courses are appropriate for people who have no prior knowledge of computer science or programming. The only requirement is a web browser. No need to install databases, download example tables, or spend time inventing exercises for yourself. Each course comes with extensive practice material. If you choose to learn SQL, you’ll write hundreds of SQL queries. If you want to learn programming, you’ll write dozens of lines of code. Simple as that. You get access to fully interactive, easy-to-understand courses. Concepts are presented simply, in a step-by-step fashion. During the course, you’ll see real-life examples and complete plenty of engaging, practical exercises. Answers are checked instantly, and if something is wrong, you can try again at any time. Depending on the exercise, hints may also be available. What does an SQL lesson look like? Start each lesson by reading the instructions and explanations in the Instruction box (1). You’ll also find brief examples here. When you’re ready, you can move on to the Exercise section (2). 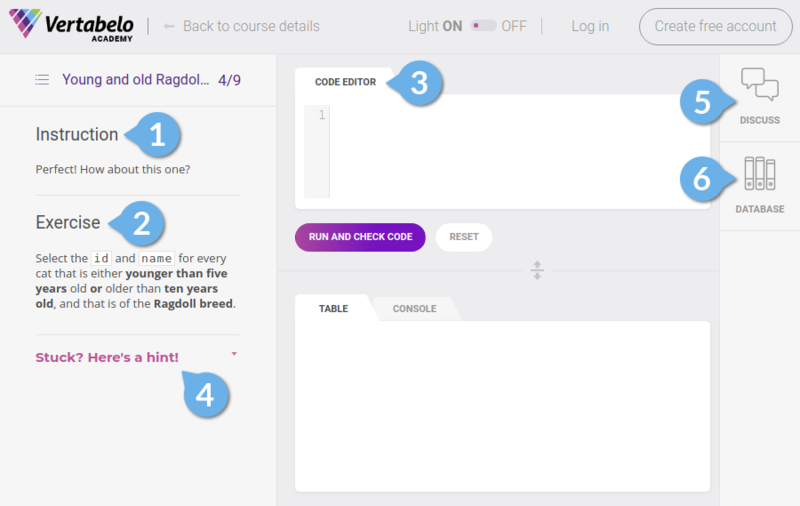 Type your answer in the Code Editor (3), or get help by reading a Hint (4). You can also Discuss the exercise with our community (5) or browse the Database (6) for that particular exercise. Everything looking good? The Console will display the query result, and you can move to the Next Exercise. Please note you don’t have to do so right away – you can always play around with the databases before moving on to the next exercise. What types of SQL courses do we offer? SQL courses — Learn how to write SQL queries from scratch. Start with the SQL Basics course to get the hang of writing SQL queries, or choose the SQL Complete Track bundle if you want to deal with advanced questions. Note: The bundle deal offer is a new feature we designed recently to reflect and support the most popular learning paths of Vertabelo Academy users. You can read more about the bundle deal details here. R courses — Succeed in data analysis, business analysis, and business intelligence with the open-source R programming language. Learn how to answer data-oriented questions and design beautiful but informative charts. Data visualization courses — Learn how to present your data visually to a group or share it online for business value. Depending on the course, we use various programming languages and libraries. Data visualization courses are designed for anyone who’s interested in pursuing data science as either a hobby or a professional career. Courses in statistics — Learn core statistical metrics and how to use them when performing data analysis. Purchase courses separately, or choose one of our bundle deals. When you buy a course or a bundle, you get instant personal access to all of its content. What do I get from Vertabelo Academy? Unlimited access to your complete, interactive course with no expiration date. A downloadable PDF certificate of completion. You can also publish the certificate on your LinkedIn profile. A 30-day money-back guarantee — If you’re not satisfied with the quality of a paid course, you can get a refund within 30 days of purchase. Start learning today, and see where our courses take you!